A DAP is, and can best be described as follows: The Dual Adjustable Pulley is a resistance machine that contains 2 independent weight stacks controlled by pin loading, which offers a fully adjustable weight for each side of the machine. The resistance is attached to 2 cables which can be lowered or raised to different heights depending on the exercise you are performing. On each cable you can attach a different type of grip or handle, again, depending on the exercise you are performing. A DAP offers a level of instability and free movement that a fixed resistance machine does not. 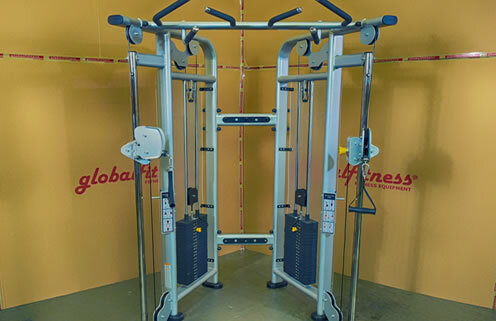 The cable and pulley system allows rotation and movement in all planes which challenges the core muscles and stabilizing muscles around the joints that a fixed machine does not. The DAP also offers an immense full body variation of exercises with progression and regression to suit every user. The DAP will also take away the challenge of space. It truly is the must have piece.